This project has been carried out for Bangalore Development Authority and Janaagraha. The source data that was used was data captured from aerial photography Read More . . The Project was executed using two Sokkia DGPS Dual Frequency Receivers. Six pair points were established at regular intervals along the corridor Read More . . This project involved the transfer of surveyed alignment of the proposed metro rail onto a georeferenced base map by making use of a High resolution satellite image,Read More . . 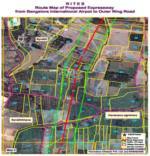 This project involved the interpretation of satellite imagery for delineation of lineaments for Bangalore district. Read More . .